In a small flat in North London a casual dinner party turns into a "battle between science and belief". After an awkward evening when comedian and outspoken skeptic Tim Minchin bit his tongue as a hippy friend-of-a- friend chattered about homeopathy he went home and wrote a poem which contained what he would have liked to have said if he hadn't been held back by politeness, cowardice or a combination of the two. The result was Storm, a poem that was subsequently turned into Storm the Animated Movie by DC Turner and Tracy King. 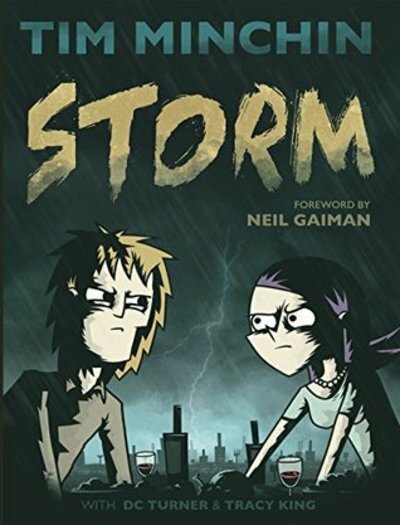 Three years later, Storm has been reworked into a graphic novel for those who prefer to mull over the pictures and have a physical object they can leave on their coffee table or pass around amongst friends. I can relate the frustration of trying not to get into an argument with someone who is just pushing all of your buttons. I used to know someone who would, any time he was feeling a bit out of his depth, abruptly just shut down any discussion by saying "well, everything's a theory", so Storm's comment that "you can't know anything! Knowledge is merely opinion" would probably have put some small cracks in my "diplomacy dike" too. It's fun to see Tim go off on a rant full of things I might think but never actually get to say, and would certainly never have put so wittily. My favourite line from the poem is "throughout history every mystery ever solved has turned out to be not magic". This would be closely followed by the pithy "You know what they call alternative medicine that's been proved to work? Medicine." The art is cute and occasionally quite beautiful. Storm talks about the beauty and wonder of the natural world and how it should be enough. Hopefully the message will make some people think. Even if it's just preaching to the choir this book will make fellow skeptics feel like they're not alone in their frustrations. Recommended for skeptics, either for themselves or to give out to lovers of woo as a passive agressive present, and for anyone interested in discussions of the nature of reality, alternative medicine or angry rants with naughty words in. How do you cull your books? Does knowing an author has done something morally questionable affect how you feel about their work? What are you reading in September 2017? What holiday reading do you have planned? Is The Fall 'misogyny in a veil of classiness'? Agent Carter - Have you seen it? Are you disapointed in all the pseudoscience on the Discovery Channel?